Letting Go of an Ended Love Relationship is one of life’s most difficult challenges. But some very specific skills for moving on with your life can go a long way toward making that challenge far less difficult! 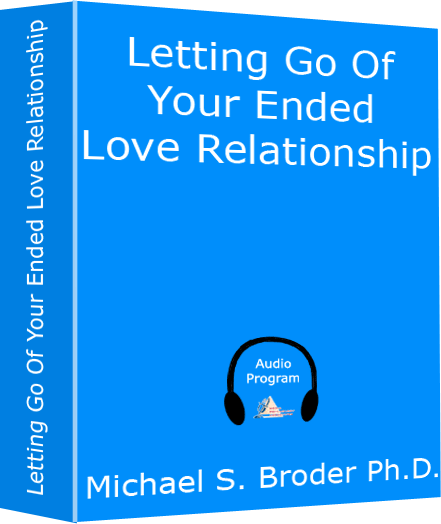 In this audiotherapy program, Dr. Broder puts the entire process of letting go and moving on firmly within your grasp, by helping you to carefully make the choices necessary to pick up the pieces and put your life back together again – regardless of whether you or your ex-partner initiated the breakup. 16 exercises, visualizations, and other powerfully effective and clinically-proven techniques and strategies are provided to support you, both emotionally and with the practical issues of your transition. This is one of our most popular and widely used programs and can help you too!